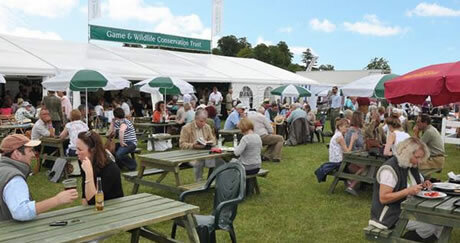 With the Game Fair at Harewood House in Yorkshire only a few weeks away (31st July - 2nd Aug) we thought we'd provide a quick update on the latest GWCT news for the show. Our stand number has been confirmed as A44 and we'll be stationed by the main arena. As in the last two years we'd like to offer you £2 off a full English breakfast at our stand - simply download this voucher and bring it with you. We're delighted that Perdix Wildlife Supplies will be on our stand's Advisory area, demonstrating the latest trapping and wildlife monitoring techniques and hardware. Demonstrating how research is getting to grips with the terrible parasite Gape Worm is sure to prove a fascinating but gruesome draw! Researchers Dr Rufus Sage and Owen Gethings will be graphically demonstrating how the parasite successfully survives in the soil and discussing how to reduce the intensity of this infection around feeding areas. We've launched a new microsite dedicated to our stand at the Game Fair so you can easily find all the important information about the what's on right here. We're looking for a team to help us on our stand so if you can spare the time, please click here to find out more. Don't forget - volunteers get in to the show FREE!